Currently, its "Clean Power" plan is generating its latest and most duplicitous Administer, Gina McCarthy, to go around saying that it will not be costly, nor cost jobs. "Clean Power" is the name given to the EPA policy to reduce overall U.S. carbon dioxide (CO2) emissions by 30% from 2005 levels by 2030. It is requiring each state to cut its emissions by varying amounts using a baseline established by the EPA. Simply said, there is no need whatever to reduce CO2 emissions. Carbon dioxide is not "a pollutant" as the EPA claims. It is, along with oxygen for all living creatures, vital to the growth of all vegetation. The more CO2 the better crops yields will occur, healthier forests, and greener lawns. From a purely scientific point of view, it is absurd to reduce emissions. Writing in The Wall Street Journal on April 22, Kenneth C. Hill, Director of the Tennessee Regulatory Authority, said "Senate Majority Leader Mitch McConnell (R-KY) set off a firestorm when he advised states not to comply with the Environmental Protection Agency's Clean Power Plan. Yet that advice isn't as radical as his detractors make it sound. As a state public utilities commissioner who deals with the effects of federal regulations on a regular basis, I also recommend that states not comply." Noting its final due date in June, that refusal would impose a Federal Implementation Plan on states "that risks even greater harm," said Hill. "But the problem for the EPA is that the federal government lacks the legal authority under either the Constitution or the Clean Air Act to enforce most of the regulation's 'building blocks' without states' acquiescence." As this is being written there is are two joined cases before the DC Circuit Court of Appeals, State of West Virginia v EPA and Murray Energy v EPA. 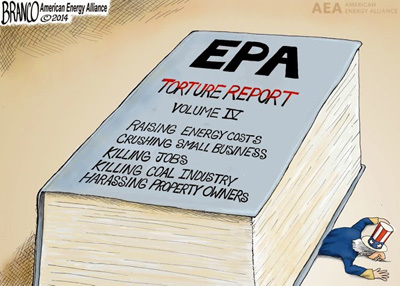 They are a challenge to President Obama's "War on Coal" and the EPA efforts to regulate its use. Fifteen states, along with select coal companies, have sued for an "extraordinary whit" to prevent the EPA from promulgating the new carbon regulations found it the Clean Power plan. Writing in The Hill, Richard O. Faulk, an attorney and senior director for Energy Natural Resources and the Environment for the Law and Economics Center at George Mason University, noted that "The EPA's argument confidently hinges on convincing the courts that the Clean Air Act doesn't mean what it says. By its plain language, the bill prohibits the EPA from regulating the power plants from which these emissions derive. Moreover, coal plants are already addressed under an entirely different section of the bill than the one EPA insists justifies its powers." The latest news as reported by Myron Ebell, the director for energy and environment of the Competitive Enterprise Institute, is that "Senator Shelley Moore Capito (R-W.Va.) this week introduced a bill to block the Environmental Protection Agency's proposed rules to regulate greenhouse gas emissions from new and existing power plants. S. 1324, the Affordable Reliable Energy Now Act, has 26 original co-sponsors, including Majority Leader Mitch McConnell (R-Ky.), Senate Environmental and Public Works Committee Chairman James M. Inhofe (R-Okla.), and Democrat Joe Manchin (D-W.Va.)." "Both Majority Leader McConnell and Chairman Inhofe have said that they are determined to stop EPA's greenhouse gas rules, so I expect quick action to move Capito's bill. In the House, a bill to block the rules, H. R. 2042, the Ratepayer Protection Act, was voted out of the House Energy and Commerce Committee on 29th April and is awaiting floor action." It's worth noting that, when Obama took office, fifty percent of America's electrical energy was supplied by coal-fired plants and, just six years later, that has been reduced by ten percent. What kind of President would deliberately reduce American's access to affordable power? It's the same kind of President that believes – or says he does – the pronouncements of the U.N.'s Intergovernmental Panel on Climate Change. The IPCC's "Climate Change 2014 Synthesis Report" claims that world will face "severe, pervasive and irreversible damage" if coal-fired and other carbon-based – coal, oil, and natural gas – energy sources aren't replaced with "renewable energy sources" – wind and solar – by 2050. It wants fossil-fueled power generation "phased out almost entirely by 2100." Now this is just insanity, unless your agenda is to destroy the world's economic system and kill millions. That would be the only outcome of the IPCC recommendations. The columnist Larry Bell, a professor at the University of Houston, points out that "As for expecting renewables to fill in the power curve, European Union experiences offer a painful reality check. Approximately 7.8 percent of Germany's electricity comes from wind, 4.5 percent from solar. Large as a result, German households already fork out for the second highest power costs in Europe – often as much as 30 percent above the levels seen in other European countries. Power interruptions add to buyer's remorse." As reported in The Heartland Institute's Environment & Climate News "European governments, once at the vanguard of renewable energy mandates, appear to be having second thoughts about their reliance on giant wind farms..." There has been a sharp drop in such projects with installations plunging 90% in Denmark, 75% in Italy, and 84% in Spain.